Kajima Satomi is the current leader of Yomi and the disciple of the One Shadow Fuurinji Saiga. He has tanned skin, dark scraggy hair and is covered in scars all around his body. 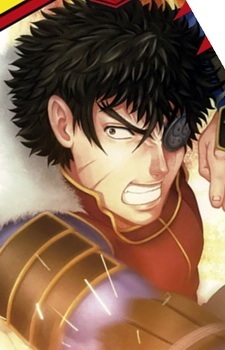 He also wears an eyepatch over his eye, though if it injured or lost is not known. He has a muscular body and wears bandages wrapped around his forearms, along with a vest with a fur collar worn unzipped over a sleeveless muscle shirt and jeans that seem tight on his body. Among his fellow Yomi members, Kajima always has a calm air about him and has a sense of humor, a great difference when compared to the others. He initially seemed extremely intelligent, easily beating Tirawit Koukin, Kushinada Chikage, and Chou Enshin at Chess, Igo, and Shogi respectively at the same time, though it was later revealed he only beat them because he could read their heart, and in essence their minds. He also has a great interest in the Shinpaku Alliance, specifically Shirahama Kenichi as he was able to beat three Yomi members. However, underneath his calm demeanor appears to be that of a very terrifying dark aura, as other members of the Shinpaku Alliance noted how they felt a great terrifying Ki from when he approached them.